I’ve always had a soft spot for RKO (Radio-Keith-Orpheum), the studio that made some of the most famous films in motion picture history yet which is often overlooked. One reason for the undervaluing of the studio is that its output did not continue with a recognised logo (the MGM lion or the Universal globe, for example, have proved more immediately recognisable to the public at large than the (equally iconic) radio tower with its radio waves pulsating- the symbol of RKO for many a year. In the great rush (which swiftly became a stampede) to diversify, RKO found itself effectively consigned to the scrapheap, a travesty considering its proud heritage. But, as the phoenix rises from the ashes, so RKO lives again- both in a range of modern film productions (sadly none as grand as its illustrious past) and in a series of fine re-releases from Odeon Entertainment. For a production company so heavily steeped in the genre tradition which was essential to the Hollywood Studio System, it seems apt to organise the releases of RKO titles by such a defining nomenclature. Thus, two recent releases fall under the heading of ‘Western’- Annie Oakley (1935) and Blood on the Moon (1948). Both titles are relatively unfamiliar- certainly not ones that appear on television with monotonous regularity, and Annie Oakley in particular is a real obscurity- one of a long line of highly romanticised (albeit highly enjoyable) biopics to emerge from Hollywood’s golden age. Both films are also getting their first UK DVD release, and Odeon Entertainment are to be praised for resisting the temptation to simply re-issue material that has been freely available before. 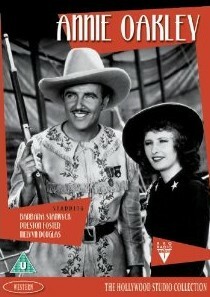 Annie Oakley features Barbara Stanwyck as the legendary female sharpshooter, and is a fine reminder of the result when you pair a young actress who is gaining confidence with a director of similar ambition and stature. The director in question here is George Stevens, who does a first rate job of keeping the narrative moving, although it is Miss Stanwyck who provides the main attraction. 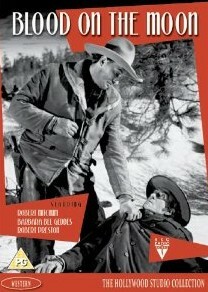 1930s films are rarely shown on television, so this release represents a good chance to view this title. Blood on the Moon (not to be confused with the earlier Blood on the Sun starring James Cagney) is another great star film- in this case Robert Mitchum, who is ably supported by Barbara Bel Geddes, Robert Preston and Western movie mainstay Walter Brennan. Another reliable director (Robert Wise) handles the material skilfully, the film’s brevity contributing in no small part to its overall impact. In releasing such genre specific titles I hope that Odeon Entertainment access two markets- those that are fans of that particular genre and wish to see more, and those who, like me, are fascinated by the allure of an RKO film. With luck, one market will morph into the other, and RKO will soon re-gain its reputation as one of the foremost Hollywood studios in the Classical era. Both 'Annie Oakley' and 'Blood on the Moon' are available on DVD from Odeon Entertainment.